Explore the strange and unusual from around the world and discuss the adventures of a ghost hunter. ← The Old York Hospital of Australia. 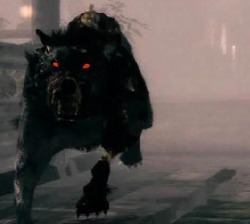 The barghest is considered by those who collect folklore to be a “black dog” type of spirit. Black dogs are a type of ghost or spirit entity that is typically associated with death, the demonic forces and hell itself. Rarely are they good omens, the Gurt Dog in Somerset and the Black Dog of Hanging Hills in Connecticut being rare exceptions. They come in many forms, from headless men in black, to black rabbits and human spirits that burst into flame. The most common of course, give the entity its name sake, that of a monstrous hound with flaming red or green eyes, huge fangs and claws, that grow in size to monstrous to diminutive, that can walk without making a sound, runs faster than any human prey could ever hope to and that walls and doors do not keep out. Whitby, while infamous for the sightings and screams of the barghest, is by no means the only place such a monster has been seen. Troller’s Gill is a limestone gorge not far from Appletreewick in the Yorkshire Dales. It is reported the home of the Barghest. During the 1960s, it served as a fluorspar and later a lead mine. Black Dogs have been reported from almost all the counties of England, the exceptions being Middlesex and Rutland. On Dartmoor, the notorious squire Cabell was said to have been a huntsman who sold his soul to the Devil. When he died in 1677, black hounds are said to have appeared around his burial chamber. The ghostly huntsman is said to ride with black dogs; this tale inspired Arthur Conan Doyle to write his well-known story The Hound of the Baskervilles. The Devon Wishthounds (‘Wisht’ is a dialect word for “Ghostly/Haunted”) are a related traditional folklore phenomenon apparently related either to the Germanic dogs of the Wild Hunt or the Brythonic Cwn Annwn. In Lancashire, the black hound is called Barguist, Gytrash, Padfoot, The Grim, Shag, Trash, Striker or Skriker. In Tring, Hertfordshire, a fierce-looking black hound with red eyes is said to haunt the middle of the road in the area where the gibbet once stood. Locally it is known as Lean Dog, and is the spirit of a chimney sweep executed for murder. When approached, the lean dog sinks into the ground. Stories are told of a black dog in Twyford, near Winchester. In Wakefield, Leeds, Pudsey, and some areas of Bradford the local version of the legend is known as “Padfoot”. Bear in mind that Padfoot also refers to the legend of a executed mule as well. There are many tales of ghostly black dogs in Lincolnshire collected by Ethel Rudkin for her 1938 publication Folklore. Such a creature, known locally as “Hairy Jack”, is said to haunt the fields and village lanes around Hemswell, and there have been reported sightings throughout the county, from Brigg to Spalding. Rudkin, who claimed to have seen Hairy Jack herself, formed the impression that black dogs in Lincolnshire were mainly of a gentle nature, and looked upon as a spiritual protector. A black dog has been said to haunt the Newgate Prison for over 400 years, appearing before executions. According to legend, in 1596, a scholar was sent to the prison for witchcraft, but was killed and eaten by starving prisoners before he was given a trial. The dog was said to appear soon after, and although the terrified men killed their guards and escaped, the beast is said to have haunted them wherever they fled. Galley Hill in Luton, Bedfordshire, is said to have been haunted by a black dog ever since a storm set the gibbet alight sometime in the 18th century. BetchworthCastle in Surrey is said to be haunted by a black dog that prowls the ruins at night. In Norfolk, Suffolk and the northern parts of Essex a black dog, known as Black Shuck or Shug is regarded as malevolent, with stories ranging from terrifying victims to being a portent of illness or death to themselves or a person close to the victim. There are tales that in 1577 it attacked the church in the village of Bungay, killing two people before running to the church in the nearby village of Blythburgh, leaving claw marks which remain today. There are also less common tales of a similar dog said to accompany people on their way home in the role of protector rather than a portent of ill omen. But in mid Essex Black Shuck is most commonly regarded as a bringer of death. Black Dog Hill, and Black Dog Halt railway station in Wiltshire are named after a dog which is said to be found in the area. Hauck, W.D. (2000). The International Directory of Haunted Places: Ghostly abodes, sacred sites and other supernatural locations. (pg. 71). New York, NY: Penguin Books. Whitby Myth and Folklore: Barghest (N.D.). Barghest. Retrieved from http://www.whitbyonline.co.uk/whitbyhistory/barguest.php Date: Monday, January 07, 2013. Wikipedia. (N.D.). Barghest. Retrieved from http://en.wikipedia.org/wiki/Barghest . Date: Monday, January 07, 2013. Wikipedia. (N.D.) Black dog. Retrieved from http://en.wikipedia.org/wiki/Black_dog_(ghost) Date: January 7, 2013. Mysterious Britain. (N.D.) Phantom black dogs. Retrieved from http://www.mysteriousbritain.co.uk/folklore/phantom-black-dogs.html Date: January 7, 2013. Shuckland. (October, 1, 2012). Old Shuck. Retrieved from http://www.hiddenea.com/shuckland/introduction.htm Date: January 7, 2013. Paranormal investigator, writer, seeker of knowledge and truth in all its forms, dark and light. Nothing is what it seems; there is nothing so strange as truth and truth is elusive as the shadow cast in the deepest night. This entry was posted in Mythology and Folklore. Bookmark the permalink. 2 Responses to The Barghest: Black Dog Ghost of Whitby, England. Reblogged this on Gwendolyn Taunton. If you have a submission idea for a haunted spot or haunting that you would like to see covered, please let me know and I will do my best to cover it! Remember, its not just haunted spots but hauntings, cryptozoological sightings and even your own experience in a haunted spot! Do you have a ghost or need paranormal assistance? Let me know! Eager to hear from you, especially if you are in the Virginia and Appalachian area of the United States! North Carolina: Hate Crime and My Thoughts. Ghost Car Accident Leads to Real Body, Surrey England. Werewolves: History, Lore, Modern Day: Explorations of Lycanthropy. Electromagnetic Survival Theory: The Scientific possibility of ghosts. New Book Series by The Author: Werewolves, adventure, romance and danger! WOLF gets published and goes live on Amazon! Please support "WOLF" on WattPad and help me spread the word!